Drawing in Google Maps vs drawing in Live Local: Which is better? Two weeks ago, Google added the ability to subscribe to GeoRSS in Google Maps. A few days ago, Microsoft updated its Live Local mapping tool, adding the ability to publish your placemark collection as GeoRSS. Other improvements included enhanced drawing tools, but also a wholly underwhelming ability to see Virtual Earth 3D in Windows versions of Firefox (once again missing the entire point of using a web browser for delivering content). And now, this morning, Google has updated its Maps product yet again, adding “My Maps”, user-generated collections of annotated placemarks, lines, and polygons. This is something of a catch-up maneuver for Google, or, more kindly, a change of tack: Until now, Google was happy to let third party developers use the Google Maps API to produce such services. Now it seems that Live Local/Live Search/Virtual Earth’s collections feature (available since May 2006) has goaded Google into offering a similar default functionality. This sets the stage for a comparison, of course. I tried out both services this morning while in a bad mood — the best mood for reviews. I decided to put some objects here in Cairo on the map. Using Google Maps to do this is very simple. Choose “Create new map” and several new icons appear on the map — for creating a placemark, a line and a polygon. Zooming in on Cairo in Hybrid mode, we had a problem: Use the roadmap of Cairo, or the satellite imagery? Which one will be accurate in Google Earth? They’re misaligned by about 100 meters, so I decided to put a placemark in both possible spots, and then drew a line between them. Alas, the line didn’t tell me how long it was, so I couldn’t accurately measure the offset. None of this detracts from the fact that these new drawing tools are very easy to use. Editing is a cinch: Just drag a placemark to a new spot — you’ll find yourself doing it over and over again just to marvel at the lovely animations. Individual polygon points are also draggable, with plenty of visual feedback while you do so. How does Microsoft Live Local stack up against this? 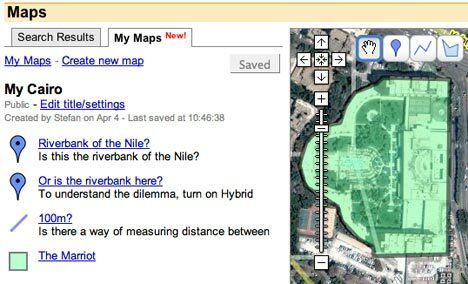 Drawing the same content in hybrid mode for Cairo was a nonstarter — there is no high resolution imagery of Cairo, so no opportunity to misalign it. Using just the roadmap, then, I found the tools to be practically on par with Google Maps in terms of functionality. Some differences: In Google Maps, editing existing content is more intuitive — just drag a placemark, or right-click on an object for editing options. In Live Local you first need to find the item on your scratch pad. Unlike Google Maps, Live Local does measure distance and area automatically for lines and polygons — but in acres and yards, which is great if you’re Shakespeare. I looked everywhere for the option to use metric units, to no avail. Finally, when it comes to editing the contents of the popup window, Google Maps has more options — you can choose between plain text, rich text and full HTML, which includes the ability to embed YouTube videos and such. Surprisingly, perhaps, neither service offers the ability to embed your map on your site or in a blog post, especially as the API makes it possible. Tagzania lets you embed your placemark maps — and, by the way, has published placemarks as GeoRSS for ages. Here’s proof, using Google Maps’ ability to read GeoRSS. So, the verdict: I will continue to use Tagzania for annotating places, especially as it uses tags to organize your “collections” and publishes them as both GeoRSS and KML. But tags are still something for the Web 2.0 crowd, not my parents, and Tagzania doesn’t do polygons and lines or embedded videos, so for this sort of project I’d recommend Google Maps over Live Local — mainly because the editing of existing content is more intuitive, and because you can stuff more stuff more easily into the popups. Pretty good review of both sites. You’re spot on when you so it’s much easier to edit shapes in Google Maps. I’ve never understood why Live Maps have such a restrictive interface when you try to edit the contents. Google while being just a touch more complex is a much better interface. Google Maps is still inferior when compared to Live Maps in my mind for 2 reasons. The first is no distance / areas. This is so easy to do I don’t understand why Google didn’t include it. I expect it will be included soon. By the way I’m in Canada and get metric units in Live Maps. I would guess that it’s a system setting at the OS level that determines units. The second issue I have is no GeoRSS support to publish your map. I understand Google wants to promote KML but it’s in excusable that they didn’t provide GeoRSS support as well. Being able to drop a GeoRSS feed into my standard RSS reader and be alerted when new items are added to a map is brilliant. Almost every web mapping product out there right now supports GeoRSS (not to mention other data services like Yahoo Pipes). If Google really wants people to share their data they should add support for GeoRSS publishing soon. MS finally figured it out I hope Google will move that way too. Now we just need to get Google to search GeoRSS for user content as well. * Interesting that you get metric units. Perhaps if there is no setting for an IP address’s country (as presumably is the case with Egypt) it defaults to yards? * I don’t see Live Local competing with Google Earth, but with Google Maps. These are web-based tools. * I agree that the ability to publish to GeoRSS is a big plus, but if I have to choose between KML and GeoRSS, I’d choose KML at the moment, though I’d really choose Tagzania, as it lets you do both. Today we introduce GeoRSS in routes drawn in Tagzania. http://www.tagzania.com/rss/route/45601 for instance. The ‘my maps’ feature of Google, a big challenge. It may help extending the idea of personal geography, and that’s not bad for Tagzania. Of course, we have to tune our machine with features that are both powerful and simple. the work you guys do is great I look forward to see what you’ll do next.I’ve checked out my maps and I think it’s great. I’ve been playing with it for a couple of hours now. I look forward to see georeferenced content found in indexed KML files. I think that will be a lot of fun. I look forward to what the future will bring with google map and google earth. best of luck! Stefan: I just figured this out. Units in Live Maps are tied to your preferred language for your MS Live account. If you’re account is set to “English (US)” you’ll get imperial units. If your account is set to “English (Canada)” for example you’ll get metric units. I couldn’t find a why to change this setting in the Live Maps interface. You have to go to http://www.live.com select the ‘Options’ link in the top right corner and then select your ‘Language and region’ from the presented list. What a horrible implementation for handling units, but at least there is way to make the change.